Do you suffer from Shortcut Virus in your flash drive .Learn How To Remove Shortcut Virus From USB Stick by DOS Without Antivirus . 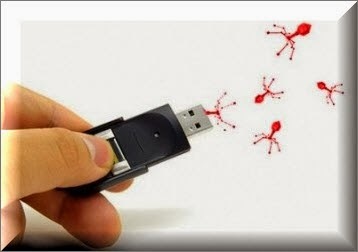 Hello My friends in all over the world , I know you like This Simple site (Flash Drive Repair ) and i promise to provide all experience and share it with you .Also you must help us for sharing this Information .Today i will explain a good solution for who suffer from Shortcut virus in USB Flash Drive .I know that you have this problem before or you will have it if you insert your USB stick in infected PC .This virus may cause a big data loss and if you have very important files so this virus will destroy your files if you don't treat this virus .As the previous picture , you will find much shortcuts in your USB flash disk like shortcut in windows .Don't worry we will explain how to remove this shortcut virus from your USB Stick , SD card,External HDD and hard disk .Just follow the next tips to remove Shortcut virus and recover your Important data . First we will not need to any software to download or any antivirus , we will use DOS Commands . Insert your USB flash drive to your PC . 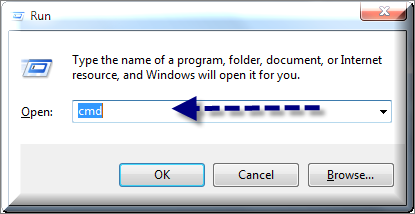 Open Run from Start Menu or just click Windows Key + R from your Keyboard then press Enter . It will open a command Window , First you must know your USB Stick Label like "F" or "G" letter now write your USB Drive Label as example G .
Write del *.lnk and press Enter . Write attrib -s -r -h *. * /s /d /l to remove Shortcut Virus . Look to the following Pic and orders with Yellow Background . 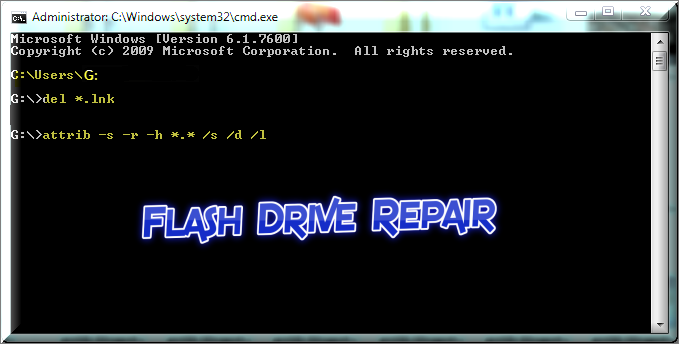 You must wait until Removing Shortcut Virus from USB flash drive . Don't forget to subscribe to our mailing list to get the most recent article of Flash Drive Repair Website and also Be a fan of us on our Facebook Page . I will be happy if i see your Precious Comment Below this article "How To Remove Shortcut Virus From USB Stick by DOS Without Antivirus " .